The Green Bean Casserole Deconstructed. Has there ever been a holiday dish more maligned, yet as beloved as the green bean casserole? Today it seems any food that comes in a can gets unfairly disgraced, but what about a dish that owes its entire existence to the can? Three cans, in fact. Yet, somehow the green bean casserole (“GBC”) remains a staple on Thanksgiving tables from Georgia to Wisconsin, white trash abomination to some, an American original to others – the Britney Spears of Thanksgiving dishes. The green bean casserole we know today was invented in the 1950s, but food historians say its roots go further back to the meat and vegetable casseroles that begun appearing in New England cookbooks like the Fannie Farmer’s Boston Cooking School Cook Book at the end of the 19th century. During WWI, the U.S. government actually encouraged families to cook casseroles and pad meat with rice and vegetables. In 1934, Campbell’s Soup Company began mass-producing cans of condensed mushroom soup. Soon thereafter, Irma Rombauer’s Joy of Cooking featured the tuna noodle casserole, which became a Depression era favorite and established cream of mushroom soup as an essential staple in casserole cooking. Jump to 1955 where New Jersey native Dorcas Reilly and her colleagues in the home economics kitchen at Campbell’s Soup were thinking up quick and easy recipes using soup and staples most women kept on hand in their pantries. 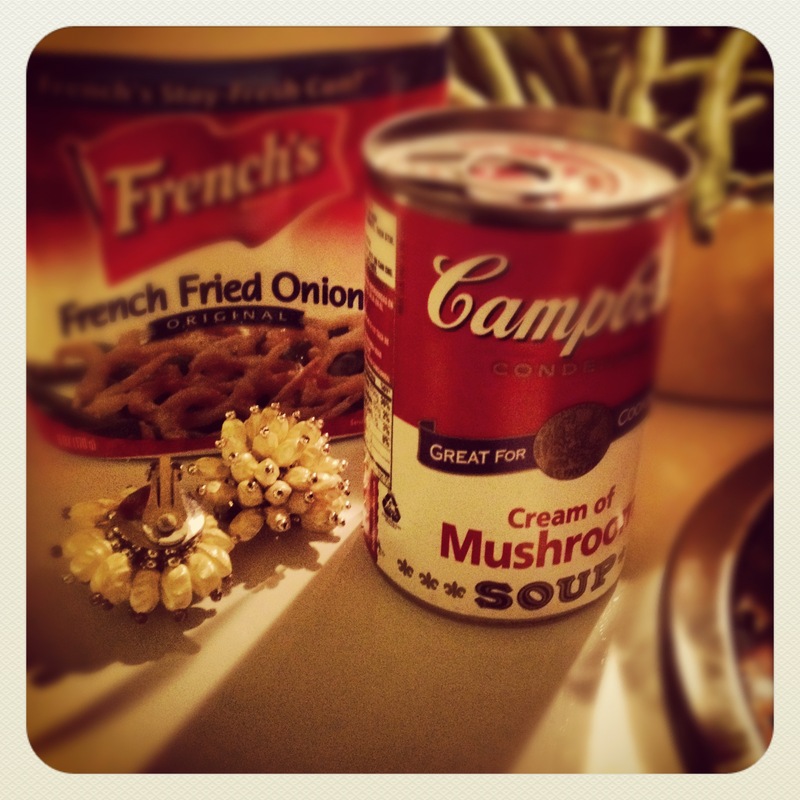 A can of condensed mushroom soup, a couple cans of green beans, and a can of French fried onions. Voila, a star was born. Whatever you think of the concoction, you should know that about 30 million “GBCs” appear on tables each Thanksgiving holiday season, according to Campbell’s Soup. There are probably just about as many variations on the recipe. Julia Child made light of the green bean casserole, yet she had a “GBC” recipe tarted up with fresh haricot verts, a lot of butter and cream, some sherry, fresh parsley, and, of course, the ubiquitous French fried onions. Martha Stewart has a recipe too. It’s more of a full makeover, combining fresh green beans, a béchamel sauce, sautéed mushrooms, red bell peppers, bread crumbs, Parmesan cheese, and fried shallots. Nothing from a can. I prefer a casserole more like Julia’s than Martha’s. You’ve got to use at least one canned ingredient or it just isn’t a proper “GBC.” To give it a little pazzazz, I add a little somethin’ somethin’ and I don’t mean sautéed almonds or paprika. Nope, give me a sprinkling of diamonds, rubies, and emeralds and you’ve got a dish fit for a queen. My secret ingredient is costume jewelry. The idea came to me one Thanksgiving when I was asked – no, make that ordered – to bring two green bean casseroles for a holiday dinner party. To turn a sow’s ear into a silk purse, I thought it might be fun to hide a little plastic baby Jesus in each casserole, like they do in those Mardi Gras King Cakes. When I couldn’t find a baby Jesus, I improvised. Let me tell you, it causes a ruckus when someone extracts an earring or brooch from the “GBC” and then proceeds to wear it for the remainder of the meal. Naturally, you must warn folks in advance because you don’t want anyone choking or breaking a tooth for a little mirth. It is best to add jewelry to a “GBC” after it is cooked. Just press it in and cover up your tracks with extra French fried onions. I once baked a cocktail ring in a casserole for thirty five minutes. Heat caused the faux sapphire to slide off the ring and the glue, I assume, just blended into the coagulated mass. No one was the wiser. Of course, the crowd was quite inebriated. I shall end my ode to the green bean casserole by putting it in context. Ten years ago, Dorcas Reilly donated the original copy of her iconic green bean casserole recipe to the National Inventor’s Hall of Fame. The museum honors Americans responsible for great technological advances that make human, social and economic progress possible. A yellowed 8×11 recipe card now sits alongside Thomas Edison’s light bulb.